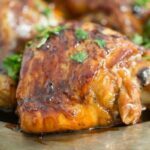 Delicious honey roasted chicken thighs with an easy to make honey soy sauce marinade, this lime chicken recipe is finger-licking good! What a chicken recipe this is! Incredibly easy and fast to put together and so sure to please just about anyone. 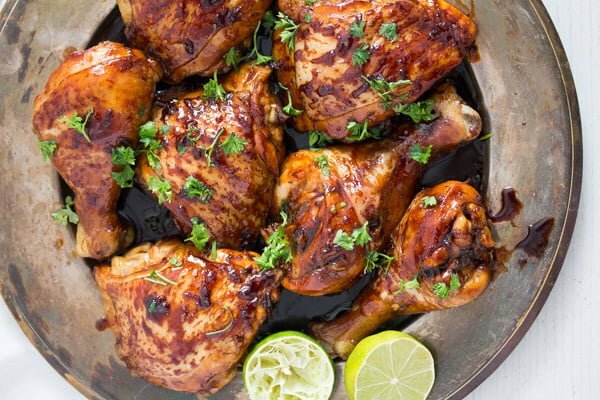 And what a divine list of ingredients: limes, honey, soy sauce and garlic… some of my favorite things, just by reading that ingredient list you know that the resulting honey lime chicken must be good. As I have mentioned a few posts ago when presenting you with the recipe for these amazing sauteed zucchini and onions, I have a new favorite cookbook author these days and that is Diane Henry. I’ve bought one of her books on a whim, because it was on offer for my kindle and I liked it so much, I got myself almost all of her other books during the next days. This recipe for honey roasted chicken is the first one in Diane Henry’s Cook Simple: Effortless Cooking Every Day. I chose to make this lime chicken a couple of weeks ago, before I even got the chance to look even a chapter further in Diane’s book. I opened the book, read the first recipe, remembered that I had bought a bag of limes a few days before and started cooking. 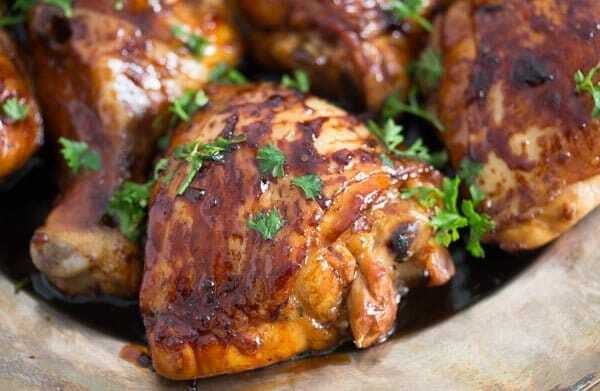 This honey roasted chicken is a perfect dish to cook for guests. First of all, it is chicken, everybody loves chicken (unless they’re vegetarian), so you cannot go wrong there. Then, even if this is only chicken, it is not plain, not something people would make and eat every other week, not like in the case of a regular chicken as mentioned above or chicken breast in a nice sauce. It is something special (at least here where I live) and I think, most people (not including my mother-in-law) would find it nice to be served something a bit out of the ordinary, yet something that is not really as “threatening” as, let’s say, squid, eggplants or lamb. Another reason why this honey lime chicken makes a good dish to be served to guests is that it is so easy to make. 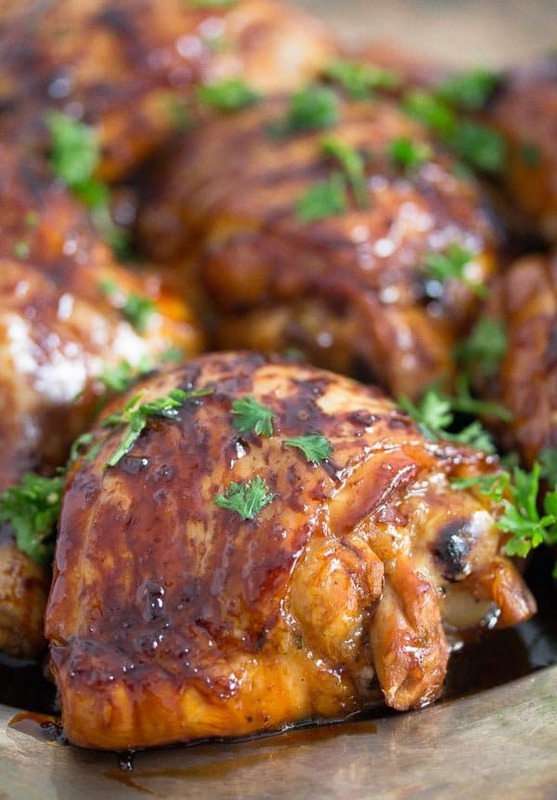 You can make the marinade, which takes minutes to put together, earlier during the day and then marinate the chicken until shortly before the guests arrive. Take the lime chicken out of the fridge about one hour prior to roasting. This will allow it to come to room temperature. Give the chicken to the roasting dish and put it in the oven about half an hour before the guests arrive. By the time you sit down to eat, the honey roasted chicken will be ready. Making the marinade for the honey lime chicken is an easy task. 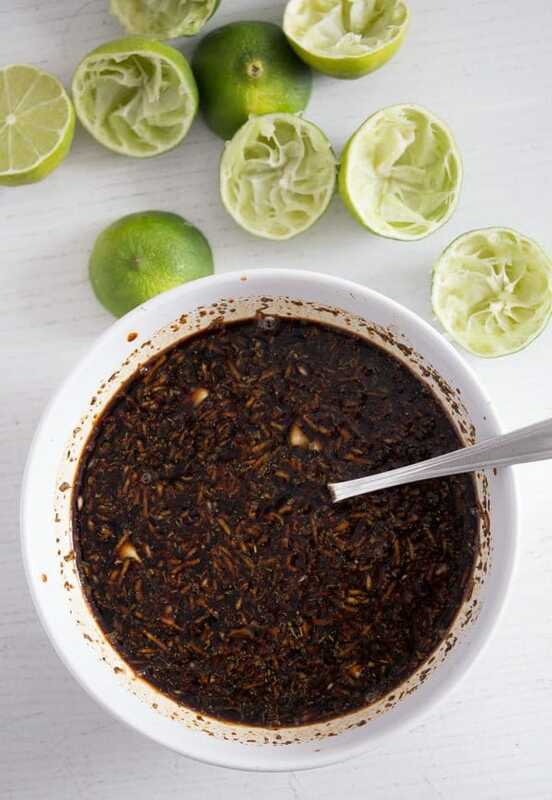 Grate the garlic cloves, juice the limes (leaving one whole for serving), chop the thyme leaves and mix everything together with the honey, dark soy sauce and brown sugar in a small bowl. Make sure to use a runny clear honey, the other stiffer, opaquer sort tastes better on toast, but it is not so appropriate for stirring in a marinade. It would probably work, but I prefer the runny kind of honey for this. Makes life easier. The original recipe calls for chicken thighs only. I bought whole chicken legs, because they are the standard that you can buy here in Germany. 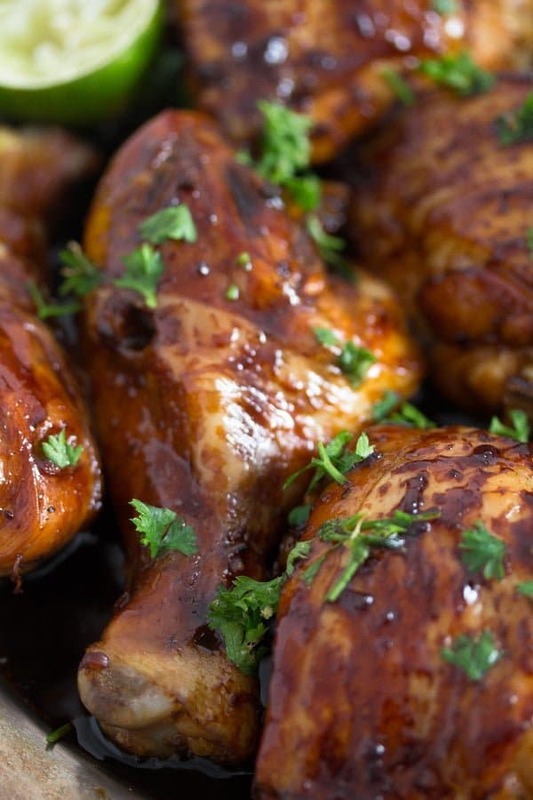 Buying only the thighs can become a challenge, they are seldom available, and they are always much more expensive than buying whole chicken legs. So, I always buy the whole chicken legs and divide them at the joint myself. Dividing the chicken legs at the joint is not particularly difficult. Use a good large knife and make sure to find the right spot where to cut. If you get it right, going through the joint will be very easy. If you encounter resistance, then you are not at the right spot. Move the knife a few millimeters more to the right or to the left and try again. Make some incisions on the underside of the prepared chicken thighs and drumsticks. This will allow the marinade to penetrate the meat better. 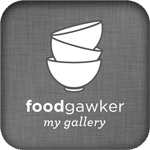 Place the divided chicken legs in a large casserole dish, a ceramic or glass dish. Do not use a metallic dish for marinating food. Make sure that the chicken parts lie in a single layer in the dish. Pour the marinade over the chicken and turn the chicken parts a few times in the marinade to make sure that they are coated all over. Cover the casserole dish with cling film and place it in the refrigerator. I marinated the chicken for about 3 hours. 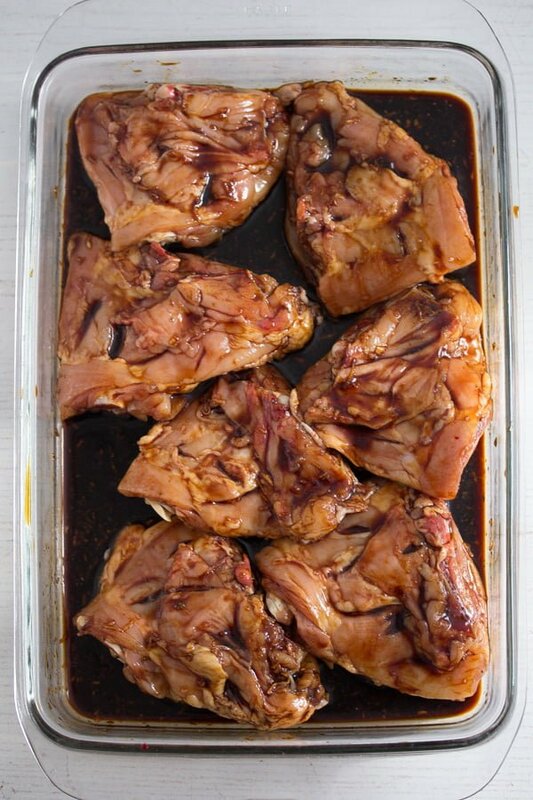 Diane Henry recommends marinating the chicken from 15 until up to half a day, so you can definitely enjoy this chicken even if you don’t have several hours time to marinate it. Don’t forget to turn the chicken in the marinade a few times in between, I did about 3 times. Take the chicken out of the fridge about 1 hour before you start cooking it, this will allow the meat to come to room temperature again. If you only marinate the lime chicken for 15 to 45 minutes than just leave it on the counter. Preheat the oven to 190 degrees Celsius/ 375 degrees Fahrenheit. Lift the chicken out of the marinade and place it in a roasting dish. Reserve the remaining marinade. 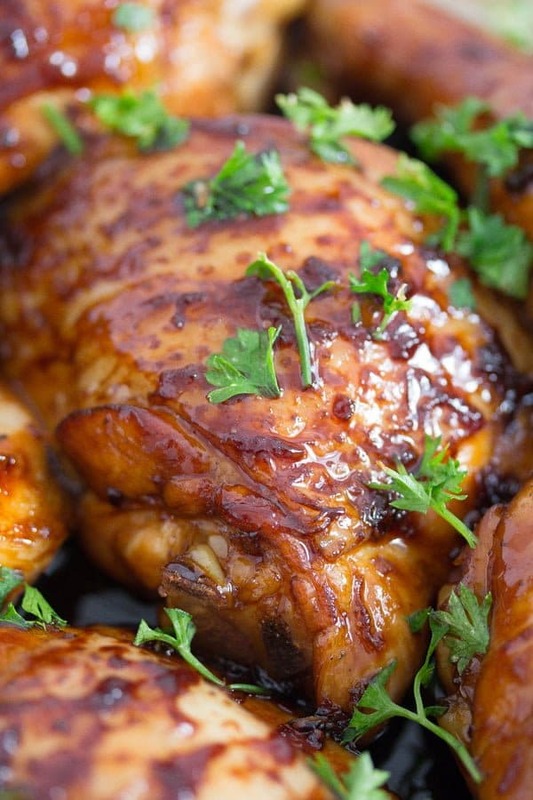 Bake the honey lime chicken for 35 – 40 minutes or until done. Baste the chicken with some of the remaining marinade during this time, I did every 10 minutes or so. To check that the honey roasted chicken is done, insert a skewer in the thickest part of the thigh, the juices should run clear. If the juices are still pink, return the lime chicken to the oven and continue cooking for a few minutes more. Check again. If the honey roasted chicken gets too dark before it is completely cooked through, cover the roasting tin loosely with aluminum foil. When done the chicken should be glossy and sticky. There is one thing I have changed in Diane’s recipe. I wanted the glaze to be thicker on the chicken, so I reduced the remaining marinade and used that to baste the chicken during the roasting time and at the end of the cooking time. In order to do that I gave the marinade to a small pot, brought it to a boil and let it bubble rather vigorously for about 6-8 minutes until it thickened nicely. This might happen even faster, depending on the pot you are using and the heat. Stop boiling the marinade when you think the consistency is thick enough for you and when it looks really nice and glossy. The original recipe recommends rice and salad and I am sure that that would taste great. However, I almost always have to make roast potatoes when having roasted chicken, my kids demand it! So, we had the honey lime chicken with roast rosemary potatoes and green salad with yogurt dressing. And fresh lime wedges from the reserved lime. We had some leftovers, which I was able to heat up in the oven the next day, about 15 minutes in the preheated oven at about 180 degrees Celsius/ 360 degrees Fahrenheit. Mix together the honey, dark soy sauce, lime juice, brown sugar, grated garlic cloves and chopped leaves of thyme. Add some pepper. Divide the chicken legs at the joint. Make incisions in the underside of the chicken parts. Place the chicken in a large shallow dish (I used a large casserole dish where I could fit all the chicken parts in a single layer). Turn the chicken a few times in the marinade to coat all over. Turn the chicken parts a couple of times in between. Remove the chicken from the marinade. Reserve the marinade. Give the chicken to a shallow roasting tin, making sure it lies in a single layer again. Roast the chicken for about 35-40 minutes or until cooked through. Don't forget to baste the chicken with some of the marinade and cooking juices from time to time, I did it every 10 minutes or so. If the chicken parts get too dark before the chicken is done, cover the dish loosely with aluminum foil. To check if the chicken is cooked through, pierce it with a skewer in the thickest part of the thigh. The juices should run completely clear. If they are still pink continue cooking the chicken for a few minutes, then check again. When done, the chicken should be glossy and sticky. 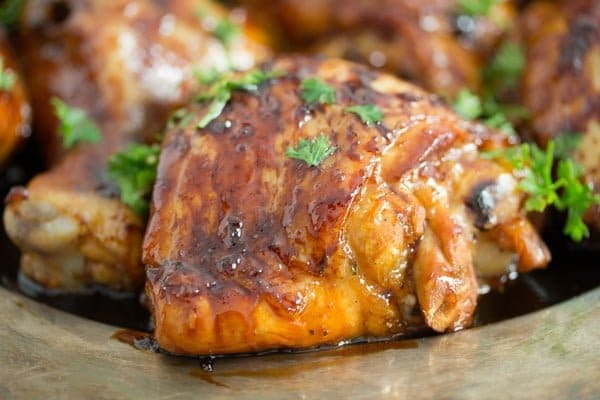 Optional: for a thicker glaze, you can give the remaining honey soy sauce marinade to a small pot and boil it for 6-8 minutes or until thicker and glossy. Use that to brush the chicken parts during the last 15 minutes of the cooking time and before serving. Slice the remaining lime and serve the honey roasted chicken immediately with lime wedges and with the sides suggested above. It doesn’t take more than a few simple ingredients to make a fantastic meal, and this chicken dish is a perfect example. Your tip on entertaining with this is great, because who doesn’t like easy entertaining?! Marinating ahead of time and tossing it in the oven when you’re ready takes the stress out. I’m all for that! Tangy, sweet, and salty!! I know this combination will not fail no matter what! The chicken looks so shiny and delicious!